Good teachers make our child grow and blossom – it's their job but most of them see it as a calling. From time to time it will be nice to thank them. Yes – they might say they are only doing their job, but we, the parents, are grateful. They're helping our child grow and develop in so many ways. This is such a cute teacher thank you gift. It's inexpensive and easy to make. Your child can definitely help and have fun while making it. At the same time he/she can also witness the miracle of creation by seeing how a dry seed turns into a green plant. Click here for the "How-to" instructions. I got this adorable idea from Merrilee's blog - Thank you Merrilee. Give your child's teacher a fruit tree to plant in his back yard. The teacher will see the little tree grows to become a fruitful tree just like his/her students. It is so rewarding to meet an old student, admire the person he grew to be and knowing that you had a part in it. Many teachers say that their favorite homemade teacher gift is a Thank You note. They keep them and read them on hard days to get some inspiration and encouragement. I think that writing a personal Thank You note on a plantable card makes it unique and original. Plantable papers sell tree-free, recycled, handmade paper products with wildflower seeds embedded in them. Everybody loves chocolate. That's what makes chocolate gifts so great and popular. Why not make your child's teacher a chocolate bouquet. It looks great, it's delicious and it's a wonderful way to say "Thank you for helping me grow"! 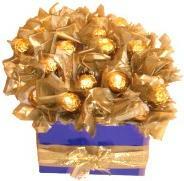 Click here for an easy, yet impressive, Ferrero Rocher Chocolate bouquet tutorial. 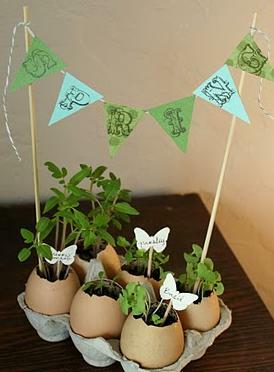 Make paper envelopes and put seeds to start a veggie garden or an herbal garden. On each envelope write instructions on how to plant and grow that particular seeds. In a few months your child's teacher will enjoy the fruits of his/her hard work and will think of your child with every sip or a bite. 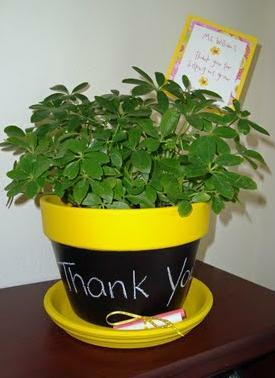 Chalkboard flower pots make great homemade teacher gifts. They are easy to make and they make a beautiful décor to the classroom or to the teacher's home. Paint the flower pot and write a note with a chalk on its body. Grass head is super easy, crafty homemade teacher gift your kid can make to his teachers. All you need is old nylon sock, seeds, soil, a small pot, glue and some decorations. It's so inexpensive, easy and quick to make so you can make many and give them to all the staff. I love practical art - taking things people don't use anymore and making practical things out of them. 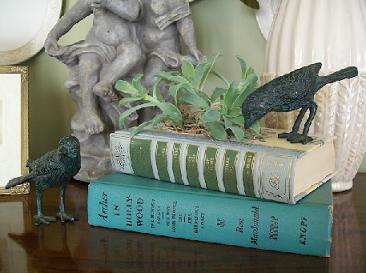 That's what this gift idea is all about – taking old books and turning them into a beautiful – decorated vintage book planter. Here is the tutorial from Cottage Hill blog. I hoped you liked these eight unique "Thanks for Helping Me Grow" homemade teacher gifts. After all teachers don't expect to receive gifts but once you decide to give them a gift put some thought in it. Make sure your gifts reflect your gratitude and appreciation. As I mentioned earlier, most teachers love Thank You notes – so – don't be lazy. Ask your child to write a few thankful words and add some of your own. I can assure you that most teachers will be touched.